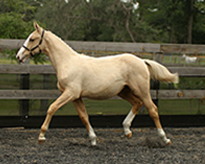 Wega is a branded and papered Oldenburg which in her case consists of half Hannoverian blood. She is a large mare in all respects but is still light on her feet. Wega Sells with a breeding to Blue Eyed Dream! 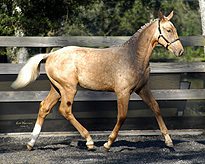 The foal with Dream would be guaranteed palomino warmblood offspring! Wega is currently open for the 2008 breeding season! Congratulations to Barbara Kidwell on the purchase of Wega! Awarded First Premium Premier , Site Champion and East/Southeast Foal Futurity Reserve Champion with AWR with an overall score of 8.1! Awarded First Premium with AWR registered/branded. 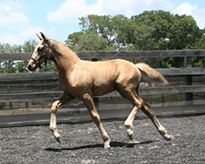 Sure to be a wonderful dressage horse or breed lovely babies! Awarded First Premium Premier with a score of 8.2 overall and 8.5 for movement. 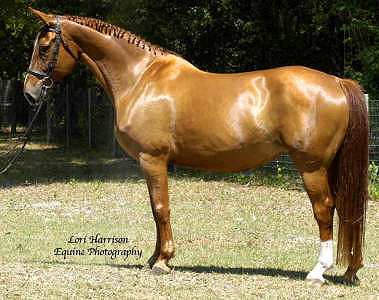 AWR Insepection Site Reserve Champion.